When we see glimpses of Africa, it’s usually because of a conflict, a safari, or a charity drive. Lanre Akinsiku, a writer from California, is spending a year traveling around Africa, going to lesser-known places to capture everyday moments. Sophie still looked unconvinced, even after a few minutes of sweet-talking. I decided to play my best hand. Under the moon’s hard light, I saw her reply with a polite smile. But it was too dark to tell whether I’d inspired her or scared her. I’d met Sophie and her friend Esme in Cape Town a few weeks before, and we reconnected by chance in Namibia’s capital, Windhoek. They invited me to visit Opuwo, the heart of Namibia’s rural north and a sort of capital for the Himba, one of Namibia’s most famous traditional communities. But no matter where we walked in Opuwo, Sophie and Esme drew everyone’s attention. On the town’s main road, the women selling handmade jewelry and ornaments on the sidewalk took a moment to look at us and whisper to a friend as we passed; the children running between the scrap metal houses peered at us with bashful smiles; the men cooking the meat on open air grills gawked at us through the smoke rising in front of them; the Himba women, their breasts exposed and their skin glowing a deep orange from the mix of ochre, butter and herbs that they apply to their skin to repel insects, openly gaped at us. The many eyes on us were as loud and grating as the rumbling trucks that kicked up plumes of dust as they drove by. ‘Why do they stare at us?” Esme asked earlier in the day. She seemed to be wilting from the attention, or maybe from the late afternoon heat. “Probably because you’re white,” I said. Later, at the only touristy restaurant in town, on a small side street away from most of the eyes, we continued our conversation. “Race isn’t an issue back home,” Esme said, referring to Holland. She was still unnerved by the amount of attention she and Sophie had received earlier. The eyes we’d seen earlier, the ones full of unspoken questions, I’d seen them before. You get the same looks when you’re the Token Black Guy. At Berkeley, where the population of black students hovers around 3 percent, I was often the only black guy in my class. Later, in various jobs, I was often the only black guy in a room full of white men. Sidelong glances toward me were inevitable. Over the years, I’ve gotten used to the eyes. And I’ve developed a knack for pretending I don’t notice. But Sophie and Esme hadn’t. In Opuwo, they were so obviously out of place that for the first time their whiteness was an issue, something to think about and consider and fret over. Why are they staring? Are my shorts too short? Do I have something on my face? Is it because … I’m white? Now, after dinner, I asked them to join me at a dive bar in an isolated northern Namibian town. A few months on the road had shown me that the fastest way to learn about a town is to go where the people like to sin. Sophie said yes. So Sophie and I walked down the dark road next to our camp site, toward the loudest bar on the main road. There were no streetlights, and we didn’t need them. The moon was full and handsome. The smoke from the meat grilled earlier in the day lingered acridly in the air, mixing with scents of diesel and trash. A cozy warmth had replaced the uncomfortable heat of the afternoon. Under the fluorescent lighting of the bar, a few guys played pool in the center of the room, and a group of men and women crowded around a jukebox in a back corner. As we entered, all of the eyes in the room slid towards us. Coy smiles erupted. You’d have thought we were the ones with orange-hued skin. 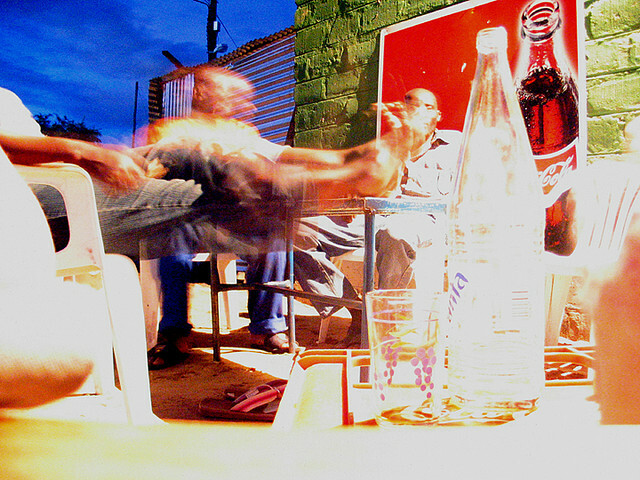 Sophie and I bought a beer and walked onto the patio, where a woman began speaking to Sophie in Herero, a local dialect. Sophie shook her head, indicating that she didn’t understand. The woman continued speaking, slurring a few of her words, then turned her glassy gaze to me. Like Sophie, I threw my hands up. She opened her eyes wide in surprise, and began speaking faster. “I don’t understand you,” I said, smiling, and throwing my hands up again. The woman barked at a man across the patio, signaling him to come to us. He was shorter than all of us and stood in a wide-legged sway. The fluorescent lighting bounced off of his bald head. He greeted us in Herero. “Hello,” we both replied in English. He spoke to us in Herero again, this time a little slower, enunciating every word. We both remained silent, with wide smiles on our faces. Then he started speaking to me in short bursts, waiting for me to respond in English, before pointing to me, and then to Sophie, and then back to me, laughing thunderously, spit gathering at both sides of his mouth. Everyone on the patio looked on in a harmony of smirks. And then I realized what was happening: Sophie was white, which was a novelty in this town. That much was obvious. But I was black, and couldn’t speak the local language, and talked like Sophie, who was white, and that was downright absurd. We’d come to experience the novelty of rural northern Namibia, and we both ended up becoming the main attraction. We visited a nearby Himba village the next day, but it felt like a waste. We’d gotten the essence of Opuwo by the time we walked back to our camp site the night before, when the bitter smell of smoke still hung in the air, and the moonlight illuminated our path and the stares of the people walking by. Lanre Akinsiku is a California-born travel and short story writer.